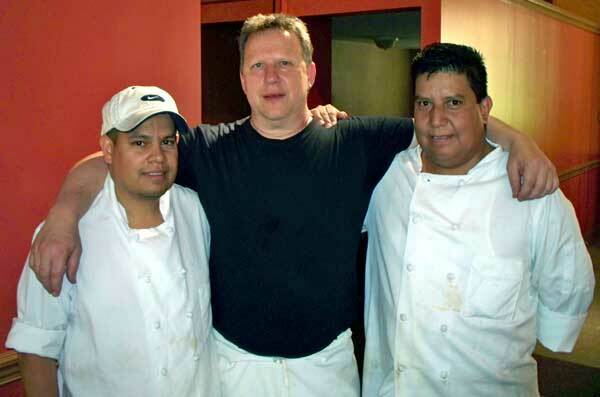 I was excited to learn recently that our very own Alan Lake, aka Jazzfood, chef and restaurant consultant extraordinaire, is helping to revive the much-missed Va Pensiero in Evanston. The new incarnation, Pensiero Ristorante--slated to open in mid-July--sounds like it will retain the spirit of Va Pensiero but offer an updated menu with more regional Italian specialties, at a more accessible price point. Below is a peek at the menu-in-progress. I look forward to visiting the new establishment. I buy the best and share it with you. 7 tastes. Wow! Great news all the way around! although the rack of lamb and accompaniments as listed above would be tough to resist. Hope those of you in the know will keep the rest of us posted on the progress and opening. Bonne chance, Jazzfood! Good news, sounds like another good restaurant for Evanston. Hot diggity dog! (as it were). Fingers crossed with every reason to be quite optimistic. Definitely looking forward to the (re-)opening. Will Alan actually chef there for a while, or is he looking for a chef? And maybe a vocalist and keyboard player, too? I was lucky enough to get to taste some of the food being worked on for Pensiero's menu today. By way of full disclosure, the owner is a long time family friend and, of course, jazzfood is a friend as well. When it finally opens, this will not be your father's Va Pensiero. Changes are underfoot that will expand the restaurant's usage of the lovely Margarita Inn in which it is housed. Since plans are still in the preliminary stages, I won't say too much about this, except to say that it should make dining at the new Pensiero a much more memorable experience than it used to be. Redecoration of the restaurant is well underway and the front of house staff is being put together. It looks like a Mid-July opening is a realistic estimate. We got to try a few dessert items as well. All in all, the food was very good, and a significant upgrade from the old menu. Some of it is still a work in progress, but by opening day things should be ready to go. Stay tuned for details as opening day gets closer. Edited to fix link to picture. Last edited by stevez on June 26th, 2010, 4:15 am, edited 1 time in total. If Jazzfood is interested in a guinea pigs, the Evanston Lunch Group might be available for the purpose. stevez wrote: I was lucky enough to get to taste some of the food being worked on for Pensiero's menu today. In five dishes and a couple of desserts Jazzfood/Alan Lake dropped thirty years from Pensiero's target demographic. Minor tweaks to be made, which is the reason for trial runs, but with Chef Lake's deft hand and owner Michael Pure's attention to detail and unbridled enthusiasm, I'm confident Pensiero will be a solid addition to the Chicagoland dining scene. Sharon, aka happy_stomach, and I were honored to sample some of the potential menu offerings from Pensiero yesterday. I'll go into more detail in a future post, but everything we tried ranged from a B+ to an A++. But Alan aka Jazzfood has very high standards. Jazzfood wrote: sorry for the lame meal. The main dining room, formerly all cream-colored, is being brightened up with Victorian-style paint treatments on all the moldings and trim, and Michael has plans to better use all the features of the historic building. Once it re-opens, this will be a significant restaurant. I'm lucky to live just a few blocks away. From the 6/30/10 Dish.... I'm looking forward to the opening! Is the 7/9 date definite? "Ah, I Remember April . . .
A mere three months after closing, the restaurant formerly known as Va Pensiero will morph into Pensiero Ristorante (1566 Oak Ave., Evanston; 847-475-7779). Michael Pure, who owns the Margarita European Inn, which houses the restaurant, took over the space after the April shutdown and hopes to reopen July 9th, with Alan Lake as the chef. Lake was a sous-chef at the East Bank Club in the early 1980s, and then he did stints as a percussionist in Los Angeles and again as a chef in south Florida before returning to Chicago in 2005. “The [Pensiero] menu is a little more regional and more approachable. Still solid Italian, but not completely based on Northern Italian cuisine,” Lake says. “We are trying to make it a place where you would dine six times a year instead of twice.” Ironic that we barely had time to get nostalgic about the closing of a restaurant named after a nostalgic opera chorus. " I was back again Thursday to sample a few more of Chef Lake's creations. Amazing. The sweet puree contrasted with the fattiness and the depth of the duck flavor; and the gorgonzola was a great counterpoint to both. A very complex dish. Who doesn't like a nice hunk of pig? 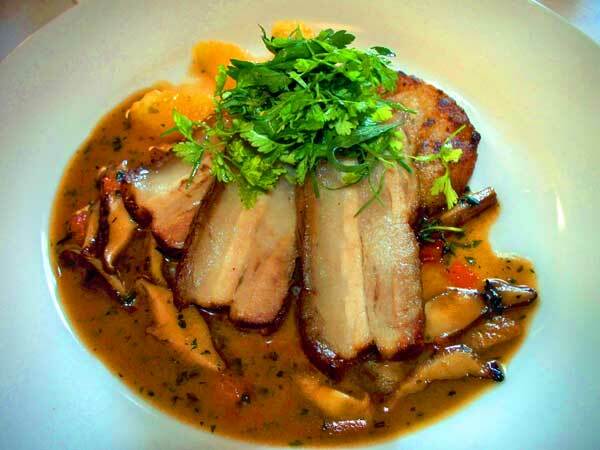 This pork belly with citrus and exotic mushrooms was over the top - the mushrooms really brought out all the (cliché alert) piggy goodness. It's considered an appetizer, but I could consume it happily as a secondi. 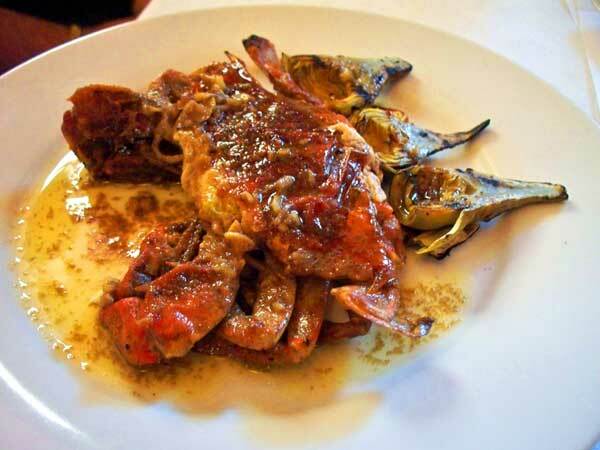 The chef was considering either a lemon caper sauce or a bagna cauda to go with the soft shell crabs - so we had to try it both ways (life is tough). I thought I'd prefer the lemon caper sauce, but upon tasting, the bagna cauda (pictured) seems like the way to go. This is the money shot ... literally. Alan has a deft and generous hand shaving the black truffles. Los tres amigos. Chuy (left) and Sergio are veterans of the days when it was Va Pensiero. Don't know who the guy in the middle is. Last edited by tarte tatin on July 12th, 2010, 4:13 pm, edited 1 time in total. We’d never been to Va Pensiero, and we were charmed by this boutique hotel and its reincarnated restaurant, Pensiero. We got an invite from comrade Lake, and were delighted to visit this classic – though disappointed to find that my trusty Canon is apparently busted (I’m going to have to defer to other, better photographers for image support). We had a lot to eat but I’ll just focus on the plates I remember the morning after. 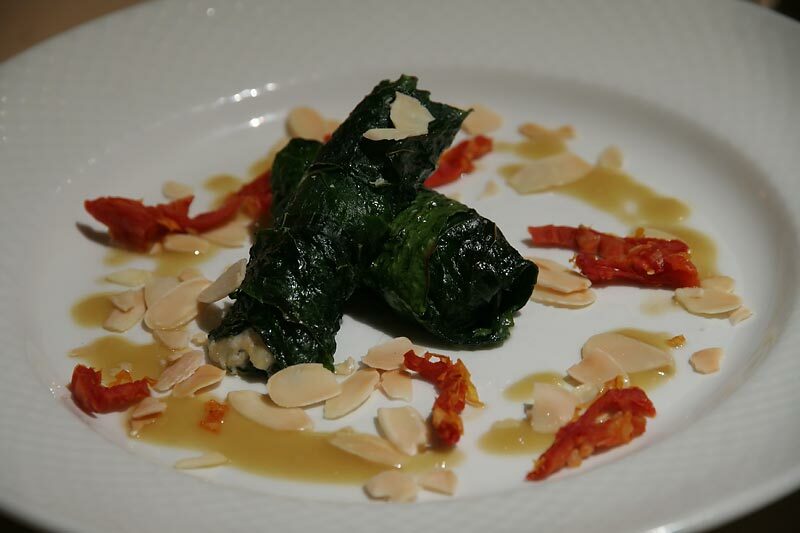 Stuffed cavalo nero was a beautiful way to start: the slightly bitter and harsh leaf and the slightly sweet and soft, fruit-flecked cheese did what an appetizer was supposed to do: it looked great and stimulated all parts of the palate and imagination, got us ready and interested to eat more. From the field greens salad, I’m remembering the fresh fig, which had been smoked somehow and was a fine little side with the salad, which showed excellent restraint in the dressing. No fan of salad, I found myself wanting to eat more. I’ve never thought much of risotto – I appreciated it in concept, and didn’t didn’t like it, but never really liked it much. The buttery, almost butterscotch-tasting version at Pensiero, offset with a flavorful hunk of stringy tail, was magnificent. I could have eaten two plates. I should have eaten two plates. Mint Creek lamb chops were perfect, though I would have liked to have had the mint reduction a bit more pronounced (personal preference; not actually recommending that the chef amp up the mint flavor). Tiramisu is one of those dishes The Wife and I rarely order because, you know, we’ve been hurt before. The somewhat grainy, mousse-like version at Pensiero is almost unrecognizable compared to other tiramisu, not too sweet, with a lot of textural interest, good. As I mentioned to one of the managers as I was leaving, I hardly ever am able to go to the same restaurant more than once: so little time, so relatively little abdominal real estate, and one visit is usually all that’s required to get a reasonable, if still limited, sense of the place. I would like to go to Pensiero again, just to see whatever cool stuff is dreamt up. It's fair to say that this place is exciting: it makes me want to visit again and see what else Alan is working on. And, yes, I'm undoubtedly biased in favor of my friend, but my experience is that bias does not make food taste better. I was really excited when I got the press release with the familiar name of Alan Lake on it. I suspected others in the forum would have known about this even before the press release came out, and I wasn't disappointed. Great to have so much input on this place. And it certainly looks like this is going to be a serious destination restaurant. May it succeed even better than hoped. We had a very enjoyable (preview) meal at Pensiero this past Sunday. As several posters above have already done, I need to disclose that I am friends with Jazzfood and Michael Pure, which garnered me an invite. But I think that if anything, that made me even more critical than I would have otherwise been. After all, I have no interest in seeing my friends fail, so I gave them the most honest feedback I could. Overall, this was an excellent meal at a restaurant that immediately felt decades younger than it did at my last visit. The updates to the room and the menu made it feel much more contemporary yet there are nods throughout the menu that evoke the old Va Pensiero in its heyday. Some of the dishes we ate absolutely blew me away. Cavolo Nero, Pork Belly and Linguini Diavolo flat out impressed me with their conception and execution. These were beautiful plates that delivered bold, innovative flavors. There were other dishes, seared duck breast for example, that didn't do it for me personally but were still expertly cooked. 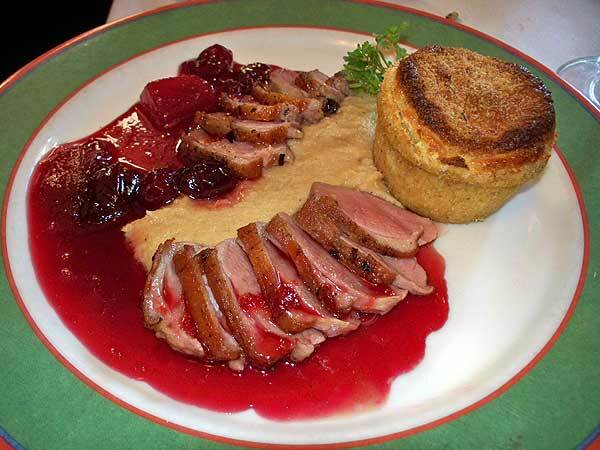 I loved the juicy duck breast, which could not have been cooked any more perfectly but felt that the plate was a bit too sweet overall for my palate. The celeriac and gala apple puree on that plate was delicious in its own right but I didn't love it in combination with the duck. No worries there. My wife adored that entire dish and proclaimed it her favorite of the evening. And the gorgonzola souffle that was served with it had us clanking forks. 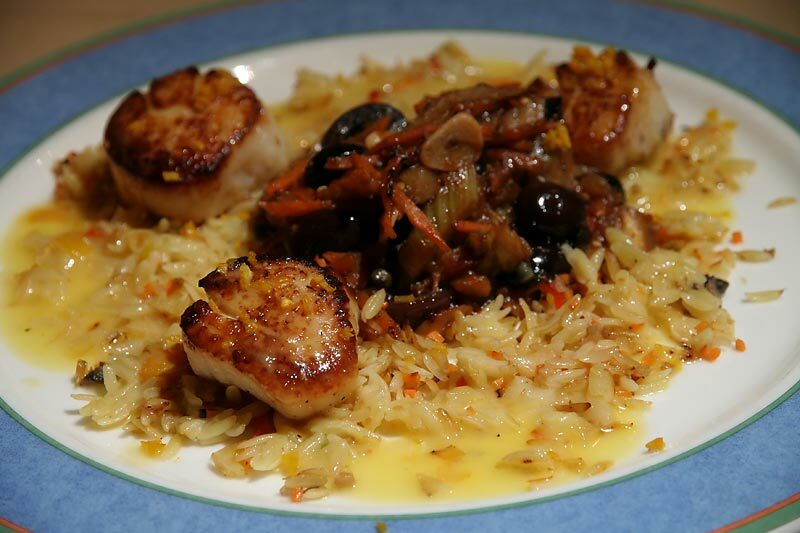 In another dish, tender-sweet diver scallops had a crispy-perfect sear and the buttery, orange-scented orzo with which they were served was utterly compelling. I didn't love the olives that were part of the caponata on that plate but again, that's just me. Here's a look at a few of the dishes we had . . . I just loved the combination of flavors and textures here. 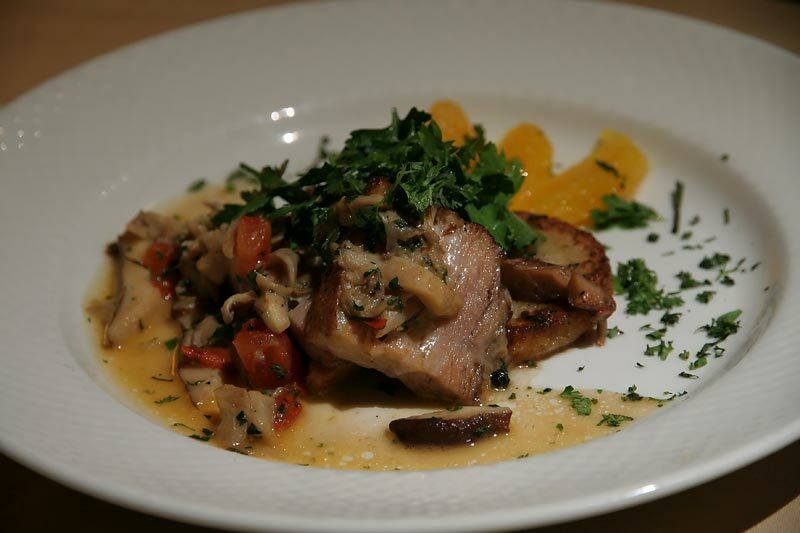 Tender belly, slightly chewy mushrooms and a wonderful brightness imparted by the mandarin orange supremes. Rich, complex and very delicious. The toasted almonds in the vinaigrette were tremendous and truly inspired. 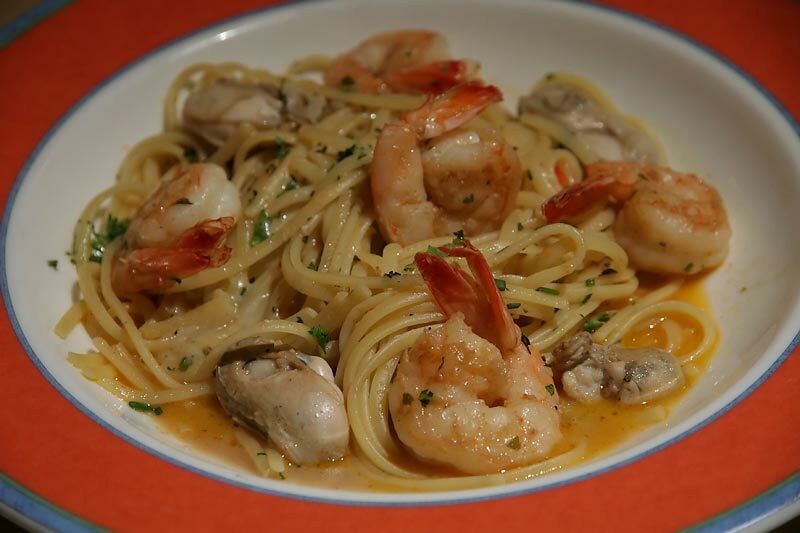 Great seafood, perfect al dente pasta and yes, the asiago really works in this dish even though I was skeptical. Rich, delectable and perfectly executed. A great way to end our meal. Considering that we were there on the 3rd preview night, I was also impressed by the service, provided by Scott. He was enthusiastic, knowledgeable, helpful, proactive and friendly. Pacing was excellent, as the intervals between courses was right on the money. This meal was comped but I have to say that following along with the menu during our meal, I thought the pricing was very fair. Scallops were $24, Linguini and Duck Breast were each $22. Desserts were $8. This is one of those menus that made it very hard to decide what to order; it's filled with tempting items. I'm very excited about the newly-enlivened Pensiero and look forward to returning. I think (and hope) that this is going to be a very exciting addition to the North-Suburban dining scene. Wow... I can hardly wait to try this place out! Thankfully not everything old has been thrown away. 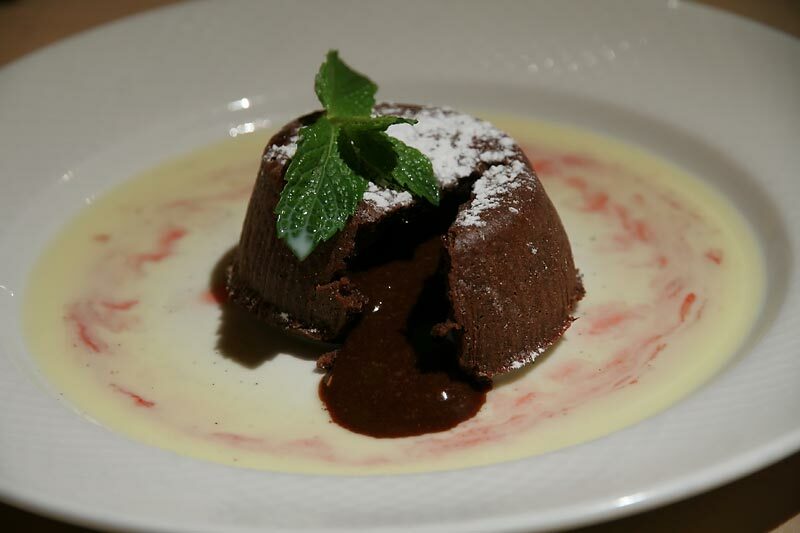 That chocolate budino was on the menu 20 years ago. It was so good I still remember it! teatpuller wrote: Thankfully not everything old has been thrown away. That chocolate budino was on the menu 20 years ago. It was so good I still remember it! One of the things from the old incarnation that they kept was the pastry chef, so the budino is unchanged from the old days. Woke up this morning with a smile on my face from a very pleasant dream. No, not a young Carol Channing, but Truffled Tagliatelle from Pensiero. Dramatic table-side service, fresh pasta mixed in a hollowed out wheel of Reggiano Parmagiano, combined with mushrooms, caramelized cauliflower, tomato concasse, Parmagiano Reggiano, herbs, pine nuts then plated. 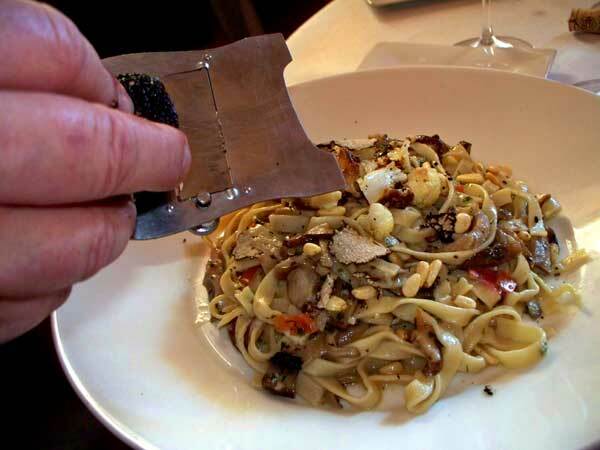 As if this were not enough Alan, with a Cheshire cat smile on his face, reaches into the pocket of his chef's coat and pulls out a golf ball size black truffle and liberally shaves it onto the pasta. It was a joy to revisit the truffled tagliatell in my just waking moments, I can only hope tomorrow morning brings a clothing optional CC dining at Pensiero, now that would be a way to start the day. 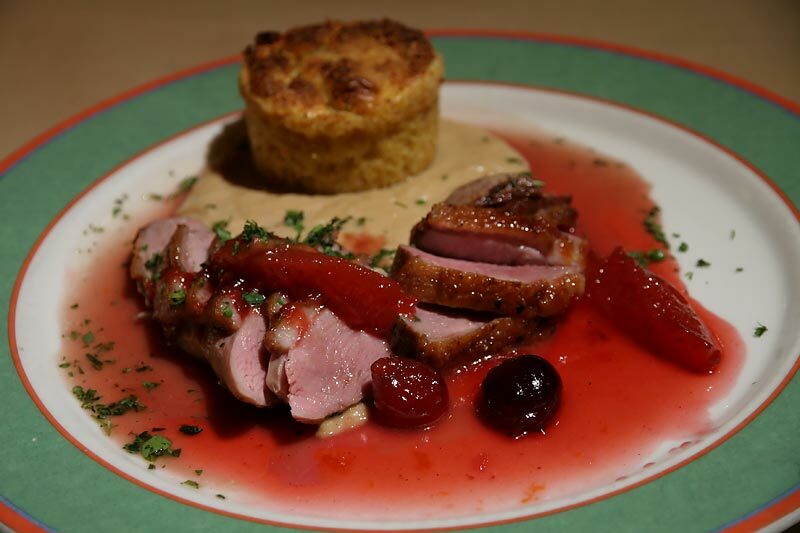 Carol Channing aside, highlights of our Pensiero meal included med-rare Mint Creek lamb rack served with potato gratin, eggplant mousse and spinach grisante. Alan was kind enough to give me the recipe for spinach grisante a couple of years ago, it has become a household favorite. Soft shell crab is always a favorite, add perfectly grilled baby artichoke and bagna cauda and you have an in-season must-order. Service was surprisingly smooth for a restaurant yet to open to the public, we attended the last of the friends and family meals, and the room was comfortable and inviting. Very much looking forward to a return visit, though I hope CC is not bumped from my dreams by Chef Lake's tagliatelle again. - an image of GWiv at a clothing-optional dinner, will haunt me for many moons. So, when do the rest of us get to eat here? jesteinf wrote: So, when do the rest of us get to eat here? Whenever you want. It's open. Excellent. Gary's post made it sound like they were still in preview mode. jesteinf wrote: Excellent. Gary's post made it sound like they were still in preview mode. I gotta learn to rite gooder, our meal with the transcendent tagliatelle took place on 7/11. Pensiero is open for biz. In fact tonight would be a good night to go there, I hear NR is showing up with a few bottles of (very) good wine. G Wiv wrote: In fact tonight would be a good night to go there, I hear NR is showing up with a few bottles of (very) good wine. Given my recent unclear post I feel compelled to point out Pensiero has a liquor license, sells wine etc. NR is simply bringing a few (very) good bottles from his stash. There is a corkage fee (I believe $15) for anyone who wants to bring a special wine that's not on their list. And I also believe that the new cocktail list debuts tonight - including house-made bitters. The lounge upstairs is a great place to enjoy a libation. 15 bucks? How hard can it be to take out a cork? How hard can it be to replace the profit you otherwise would have earned (on average) from someone ordering off the wine list? I know what it's really for ... just think maybe, at some point, we should stop calling a profit recovery fee a corkage fee. $15 seems steep to me, but others more accustomed to dining at the higher end of the spectrum might consider it more reasonable than do I.